One of the occupations of medieval monasteries was the recording of history, which served to help them prove their claims to land and privileges. Also the passage of time is important in Christian theology as, for instance, the world was believed to be progressing toward the Last Judgement and Second Coming, and monasteries were supposed to be keeping things on track for that. Nearly always history was thought of in terms of Christian history, the story of salvation. 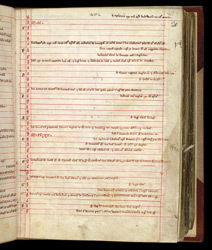 This manuscript of annals kept at the benedictine abbey of St Augustine at Canterbury gives brief accounts of events from the first archbishop of Canterbury, Augustine, to 1300, or contemporary with its making. This page had been divided with lines, ready to receive entries as news of important events reached the ears of the monks at St Augustine's. It was reserved for events of the years 1199 to 1234 in a chronological table covering the period from the birth of Christ to 1300. Events pertaining to Canterbury are prominent, and it mentions Henry III and Philip the Bold (of France), referring to Magna Carta but not mentioning King John.